We went to Solenad last weekend so we can check the local products at Tienda Sa Ayala Malls. After buying some local products, we decided to have an early lunch in Nuvali. There are so many restaurants in Nuvali, you can choose from Solenad 1, 2 and 3. But since we are in Solenad 3, we checked the restaurants that we haven’t tried yet. As far as I can remember, we only tried Peri-Peri Charcoal Chicken and Sauce Bar, Hokkaido Ramen Santouka and of course Kuya J. We were looking for one restaurant so before we entered the building, we asked the guard for directions and he said “Ay sir, dun yan sa kabila, “The Farm Organics” lang nandito. So my husband and I contemplated kung lalakad pa ba kami or magFarm Organics na lang kami. Of course, tinamad na kami maglakad so we entered the building and went straight to the restaurant. As we all know, not all products that we see in the market are all natural or organic. If we ever see natural or organic products, it is too expensive. In 2010, Tom and Tanya decided to turn their ranch into organic livestock farm and it was certified organic by the OCCP in 2011. They started selling their products in the supermarket and now they also have different restaurants where you can try their organic beef. 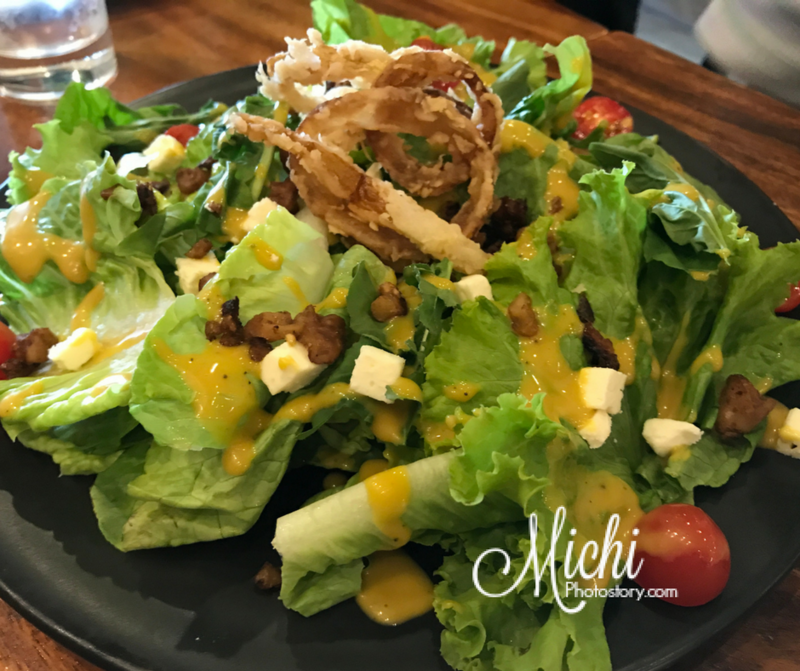 The Farm Organics offers certified organic grass-fed beef from their farm in Masbate. Not only that, they make sure that the ingredients that they use in their soups, salads, and dressings are fresh and high quality. They are using organic eggs too. 1. Free-range or pasture-raised livestock that are antibiotic and growth hormones free. They produce organic meat poultry, eggs, and dairy. 2. Organic produce is non-genetically modified crops which are grown without pesticides and synthetic fertilizers. 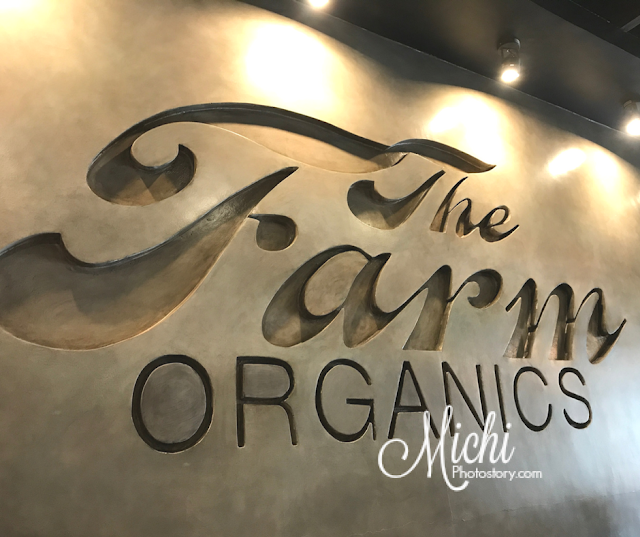 We ate at “The Farm Organics” before, they have a branch in Twin Lakes Tagaytay. But at that time, we took advantage their buffet meals from 10-7PM. But here in Solenad 3 branch, I did not see the buffet package so we checked their a la carte menu. 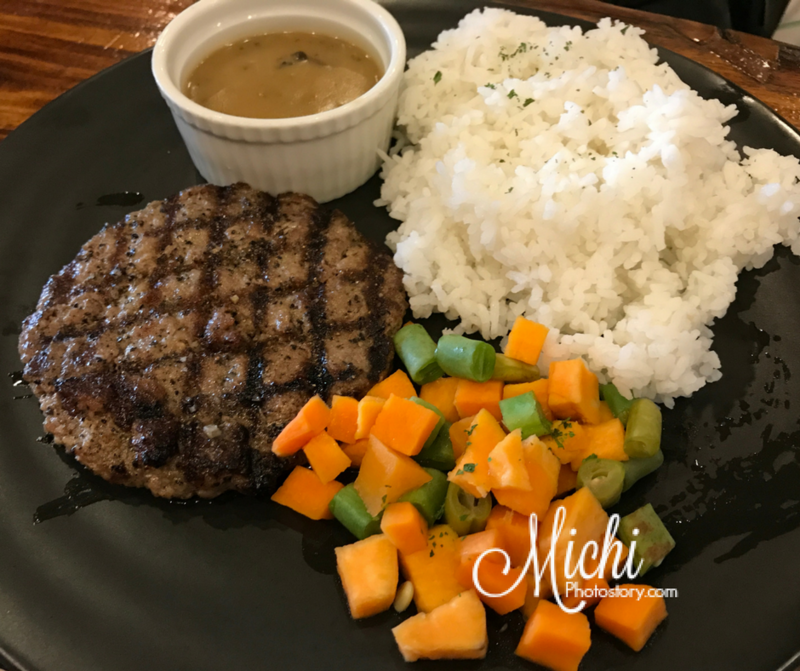 We were still full from our binatog and corn with butter and cheese morning snack so we just ordered Farm Salad P340, 1 Local All-Natural Burger Steak P190 and 2 orders of Local All-Natural New York Steak at P490 each. My husband and in-laws enjoyed the Farm Salad. I did not try it, alam niyo naman hindi ako mahilig sa raw vegetables. Hehehe! My husband ordered the Burger Steak and he liked it and according to him, the burger patty is very juicy. 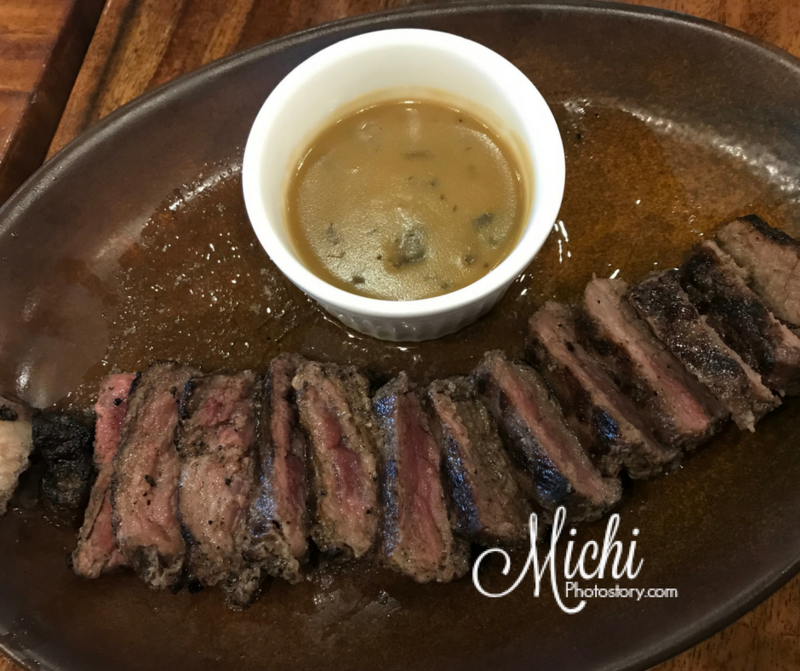 My son and I ordered the New York Steak, share na lang kami but when I saw the meal. Good for one person lang pala yung beef, malayo sa picture sa menu. Mas maliit in real life. Hehehe! Good thing busog pa kami sa binatog so hindi naman kami nabitin. The meal includes one cup of rice or farm bread and mushroom gravy. The steak is good, though nadisappoint lang ko sa size. My husband teased me, sana nagburger steak ka na lang. Me: Oo nga, mas mura pa. hehehe! We always go to Solenad every time we visit my brother and his family in Sta Rosa. Dun talaga ang hometown ko at nakakamiss talaga hehehe. Anyway, haven't tried this resto pero parang nadaanan na nga namin yan before. Hubby is not really into organic kaya hindi ko siya maaya dun lols. But infairness, the salad looks yummy ha! I love Solenad Nuvali, we had our first outdoor movie experience there. I've been hearing this The Farm Organics but haven't tried. 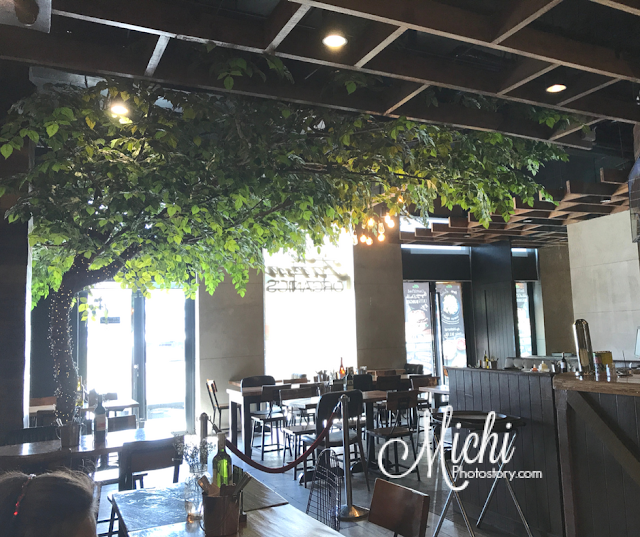 I love the interior, suits the name of the resto. Nakakagutom yong New York Steak, maliit lang siguro kasi mas mahal pag organic. I have tried organic foods at Costales Nature Farm, sobrang sarap at freshly picked from their farm.